Gross margin is the retail cost, minus the wholesale or direct costs of a product or service. Expressed in percentage terms, gross margin represent profits as a percentage of revenues (excluding indirect costs like rent). Markup is the amount charged for a product or service over the wholesale or direct costs. A product that retails for $10 and wholesales for $8 has a gross margin of $2, a gross margin percentage of 20%, and a markup of 25%. For up to 3 products or services you sell, simply enter the retail price, wholesale price, and number of goods sold (either projected or actual) and hit calculate below. The gross margin & markup calculator will enable you to see gross margin ($), gross margin percentage, and markup for individual products or services and combined numbers for a group of products or services. Be sure you’re using POS software like Square to keep track of what’s selling and what your profit margins are. Try it for free. If you just need help calculating these percentages, then you’re all set. If you would like a little more information about what you just calculated, and what it means for your business, then keep reading. The equation for finding gross margin is gross profit divided by revenue. For example, if you own a clothing store and buy a shirt from your vendor for $5, and then sell it to customers for $20, then your gross profit is $15. You can then divide your gross profit by your revenue ($15 / $20 = 0.75 or 75%). This means your gross margin is 75% and you will keep 75 cents of every dollar earned to go towards other business expenses and/or profit. This equation may seem simple (and it is) but the meaning behind the percentage is significant. Gross margin is a good metric of company health and efficiency, especially when compared year over year. If your gross margin drops significantly from the year before, you will need to reevaluate your costs and revenue in order to determine where the issue is. Keeping an eye on your gross margin will alert you to major changes with your company, before your margins are so low that you are no longer able to cover costs. You can compare your gross profit margin with others in your industry to determine how you stack up against the competition. 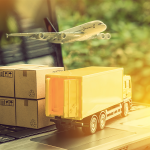 Lowering your wholesale cost – If other companies in your industry have higher margins, it could be because they are able to produce the product at a lower cost. Look for less expensive vendors or processes to reduce manufacturing costs. Increasing the retail price – By selling your product at a higher cost, you’ll be able to earn more for each item sold. Increasing the retail price might seem like the easiest option. Simply mark your products at a higher price and you’ll immediately increase gross profit margins without having to cut costs. However, if your markups are too high, then people will be less likely to buy from you. That’s where the markup calculator comes into play. The price markup is the percentage increase on the original wholesale cost of the product. For example, if you own a clothing store and buy a shirt from your vendor for $5 and sell it to your customer for $20, then the markup is 300%. Markup is profit divided by cost, so in the example above it would be $15 / $5 = 3 or 300%. Finding the sweet spot for markups is tricky, since if you price your products too high, then people will not buy from you. If your price is too low, then you won’t generate enough revenue to cover costs. In order to accurately markup your products, it’s necessary to consider what others in your industry are doing. This is especially true in today’s digital age where consumers can instantly compare prices among multiple similar companies. Below are average markup percentages for various retail products. 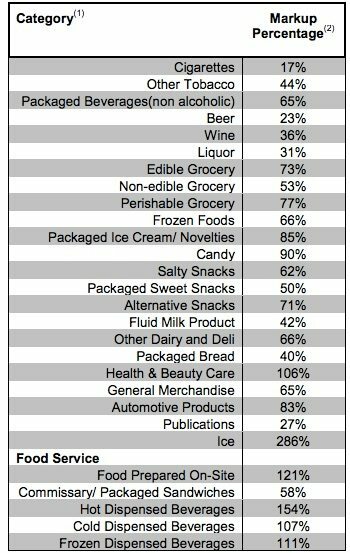 You’ll notice that some products, such as ice, have a much higher markup percentage than products like cigarettes and beer. To learn more about product pricing, view our ultimate guide. Though it’s important that your products are priced competitively, if you are struggling to find a way to lower costs, there are other ways you can maintain customers even with a higher price. Figuring out the right margin for your business and the best markups for your products is not a simple process. The first step is knowing what these metrics are. By using our gross margin and markup calculator you will be able to quickly find these numbers. Looking for additional help with your small business? View all of our articles related to starting a business. Square POS - FREE Signup!